Joseph Cuthbert Sutton was born in Ritherup Lane, Rainhill in the summer of 1897. He was the son of John and his second wife, Mary Anne Sutton. John was a house painter. In 1911, Joseph was a boarder at St Cuthbert’s Grammar School, Bath Lane, Newcastle-on-Tyne where Monsignor Horace K. Mann was the Head Master. Joseph was the step-brother of Robert Augustine Sutton and although no reason can be found for him attending the above boarding school, it may have been because both parents had died and some person or organisation offered to pay his fees. 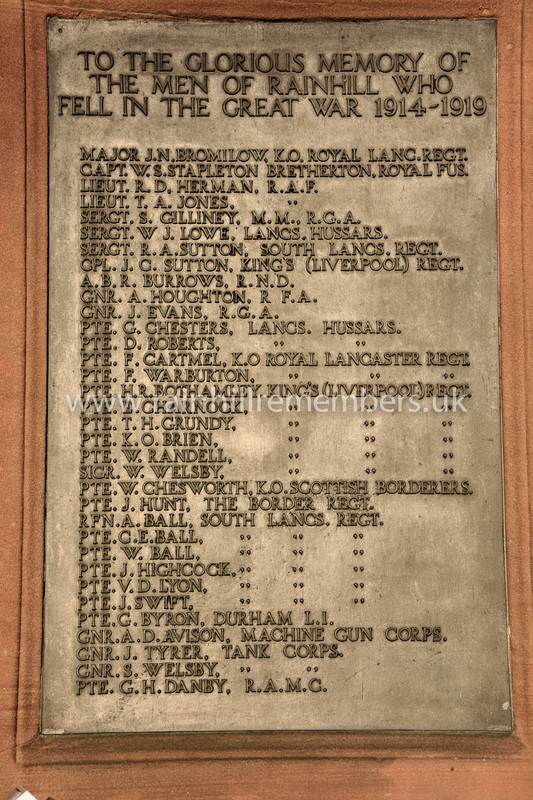 He enlisted in Liverpool and joined the King’s Liverpool Regiment, 6th Battalion, although it is noted that he was formally in the Cheshire Regiment with the number 19017. On 24th February 1915 he travelled to war in France. He became Lance Corporal 241628 with the King’s. He is listed as killed in action on 11th April 1918, aged 20 in France and buried in Lapugnoy Military Cemetery in grave 1.D.17. Medal entitlement: - British War Medal and Victory Medal. Sergeant Joseph Cuthbert Sutton is remembered on the War Memorial on Warrington Road, Rainhill.